Beauty Generation takes the G1 Champions Mile at Sha Tin today under Zac Purton. Beauty Generation put himself into the picture for Hong Kong Horse of the Year honours after confirming his place as the best 1600m horse in town with victory in the G1 Champions Mile at Sha Tin today (Sunday, 29 April). 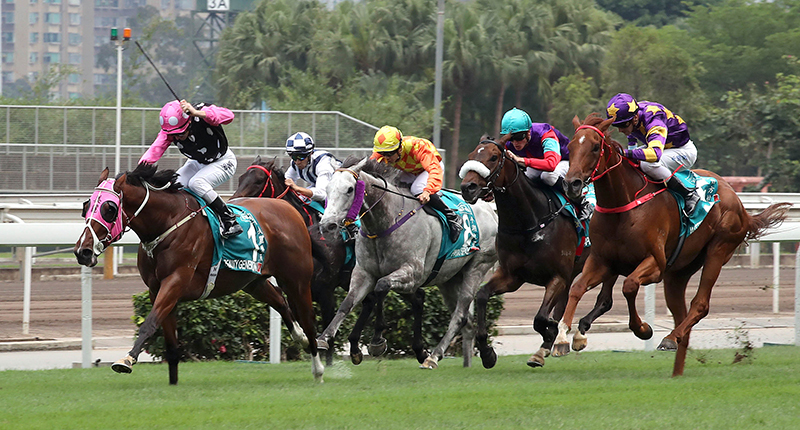 The win in the HK$18 million feature was the John Moore-trained Beauty Generation’s third Group 1 score of the season, following his wins in December’s Hong Kong Mile and the Queen’s Silver Jubilee Cup over 1400m in February. 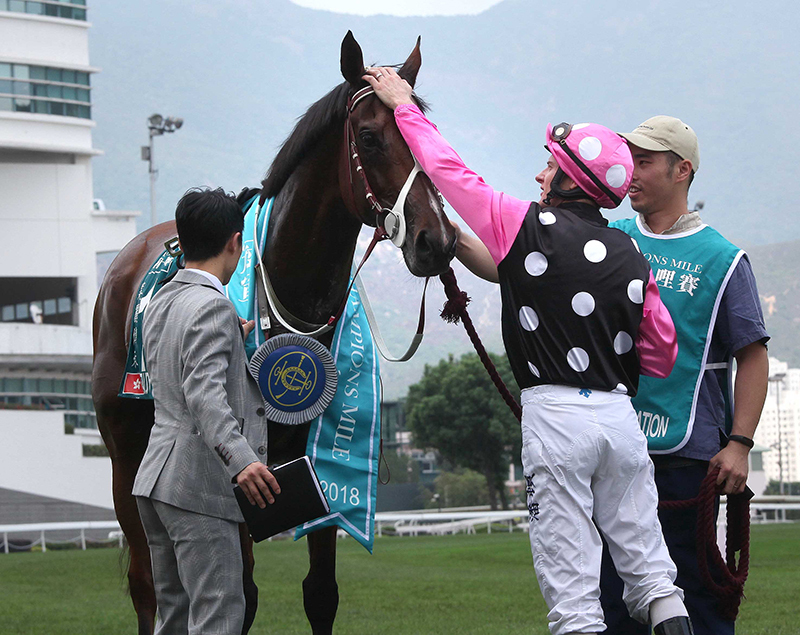 In completing the Hong Kong Mile-Champions Mile double, Beauty Generation joined an elite group of horses: Good Ba Ba (2007/08), Able Friend (2014/15) and Maurice (2015/16) were the only three to have achieved the feat before today. Sent off the odds-on favourite in the field of eight, Beauty Generation jumped cleanly from gate one. Out of the barriers, though, rider Zac Purton had to bustle Beauty Generation along to assume his favoured front-running role with Pingwu Spark, Singapore Sling and Southern Legend all eyeing off the lead early. “It wasn’t ideal that he didn’t really muster out of the gates like he normally does,” Purton said. “He didn’t really dwell, he just wasn’t that quick. I actually thought Pingwu Spark had the speed to cross me early and he was going to cross, but as he was coming, he seemed to spot something and shy and he lost his momentum. That allowed me to roll back underneath him and take control. Lengthen he did, with Beauty Generation putting up a break on the chasing pack and sustaining a length margin to the line. The John Size-trained Western Express finished second in a repeat of the Hong Kong Mile one-two, with Caspar Fownes’ Southern Legend prevailing over Beauty Only and Singapore Sling in a three-way photo for third, a length and three-quarters from the winner. Moore indicated that future plans for Beauty Generation are yet to be determined, but said they will be geared towards attaining the Horse of the Year title. Possible options include a big step up in trip for the G1 Standard Chartered Champions & Chater Cup (2400m) or the HK$9m Kranji Mile in Singapore – both scheduled for the last weekend in May – or he could be put away for the rest of the season. “Coming into today, you’d have thought it was a close call between Time Warp and Beauty Generation for Horse of the Year,” Moore said. “Pakistan Star might have entered the conversation today, too, but Beauty Generation has won three Group 1 races and done it against international company so he might just be the best horse in town. Beauty Generation gets his third G1 score of the season. Placegetters Western Express and Southern Legend may also be heading abroad; both hold entries for the G1 Yasuda Kinen (1600m) at Tokyo on 3 June.